Ever seen a V-shaped flock of black birds flying purposefully in the sky near a water body? Or a black bird sitting still with its wings spread out in a small village pond? Or a bird’s head sticking out of the water at a lake or pond? Did you notice any large colonies of black birds nesting on tall trees by a wetland? These were all probably cormorants! 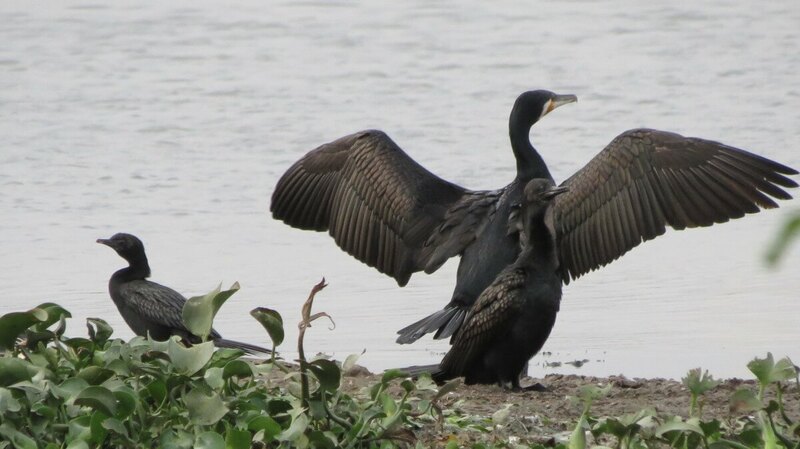 From L to R: Little Cormorant, Great Cormorant (with wings open), Indian Cormorant. There are three species of Cormorants regularly found in India. All three are widespread, with a largely overlapping preference in habitat and are often mistaken for each other. 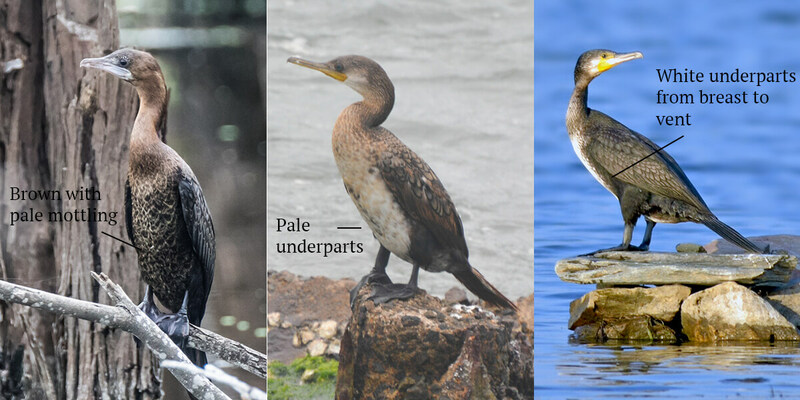 This article takes a step by step approach on distinguishing between the Little Cormorant Microcarbo niger, the Indian Cormorant Phalacrocorax fuscicollis (also known as Indian Shag) and the Great Cormorant Phalacrocorax carbo. Little Cormorant: The Little Cormorant has a small head which can appear rectangular due to the steep forehead. The bill is short. Indian Cormorant: The Indian Cormorant has an elongated, oval-shaped head with a long, narrow and finer bill than the other two cormorants. 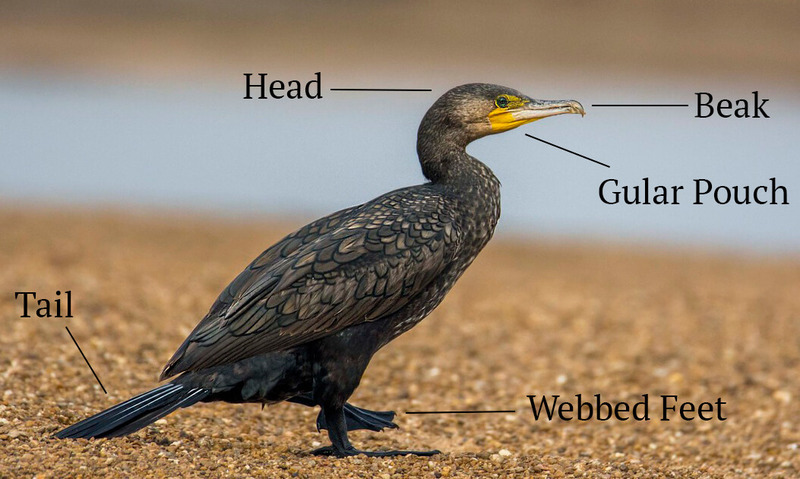 Great Cormorant: The Great Cormorant has a large head (and a much thicker neck than the other two cormorants) with a long but thicker and larger bill. Little Cormorant: The breeding adult appears all black on the head, whereas a non-breeding adult has browner pouch and bill with some white on the chin. Indian Cormorant: The breeding adult appears glossy black with greenish-blue eyes and a white tuft on the ear-coverts. The non-breeding adult is browner with a yellowish gular pouch and white on throat. Great Cormorant: The breeding adult has extensive white on head with a red spot at the base of the bill. The non-breeding adult has a yellow gular patch with white throat and cheeks. Note: In breeding plumage, the Great Cormorant also has a white spot on the lower flanks. Little Cormorant: Smaller than the Indian Cormorant and appears stockier/more compact in built. The neck is short but the tail is proportionally the longest of the three cormorants. Indian Cormorant: Most slender-looking of the three cormorants. Smaller than the Great Cormorant, with slimmer and longer neck and relatively long tail. Great Cormorant: The largest of the three cormorants, with a thick neck, large head and stocky appearance. The heavy beak and the short tail are quite apparent when it is perched as well. Cormorants are often seen moving around between waterbodies and are frequently encountered in unlikely habitats as they fly over. Cormorants can easily be told apart from other groups/species in flight but they are often the most difficult to ID to species in flight. Little Cormorant: In flight, note the small size but proportionately long tail and short, thick neck, and the fastest wingbeats. Indian Cormorant: May appear as big as a Great Cormorant or as small as a Little Cormorant, but is the most slender of the two with a long, thin neck and long tail. Great Cormorant: This species appears quite large in flight with thick neck, short tail, heavy body and broad wings, with the slowest wingbeats. a. If the bird appears large; neck and tail appear short and the body is bulky, then the cormorant is likely to be a Great Cormorant. b. 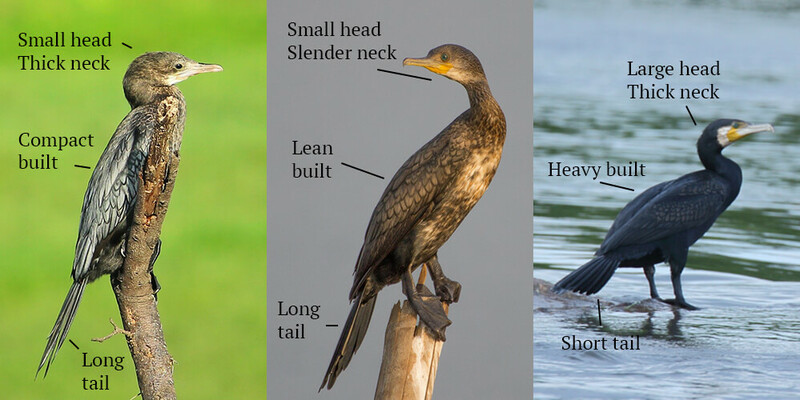 If the neck is as long as, or shorter than the tail; and both neck and tail are almost as long as the body, then the cormorant is likely to be a Little Cormorant. c. If the neck appears longer than the tail but the bird retains an overall slender look, then it is likely to be an Indian Cormorant. Little Cormorant: Juveniles/immatures of the Little Cormorant have brown underparts with some pale mottling. Indian Cormorant: Indian Cormorant juveniles and immatures have a paler breast and lower belly. Great Cormorant: Juvenile/immature Great Cormorants are very distinctive with all-white underparts from throat down to the base of tail. 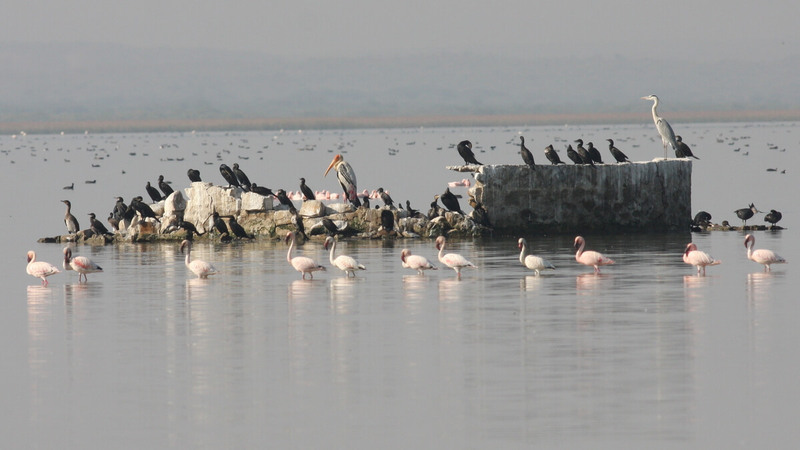 All the three species are associated with wetlands and waterbodies across India. The Little Cormorant may be found in small village ponds, garden ponds as well as large freshwater bodies such as rivers and lakes and even estuaries. The Indian Cormorant is a bird of larger freshwater wetlands and seems to do quite well even along mangroves and estuaries. The Great Cormorant is usually partial towards larger wetland systems and waterbodies, and seems to be largely absent from parts of the western coast. Little Cormorants are generally not as gregarious as Indian and Great Cormorants. While Little Cormorants may usually be seen feeding singly or in small groups, larger congregations and loose flocks are also seen in bigger waterbodies. Both Indian and Great Cormorants tend to be quite gregarious. Great Cormorants form communal roosts even outside the breeding seasons and large numbers may be seen adorning tall trees around big lakes and rivers. They usually move and swim together as well. Indian Cormorants are known to fish cooperatively – where a number of them gather in a big waterbody and round up fish and other prey items to eat. Wow, very nice explanation with pictures too. Even in field guides we don’t get these details. Have to save this page for reference any time. Thanks for everyone who were behind this. Expecting similar post for warblers, as migration have started. Thank you! Please see these links for some warbler ID tips. More to come! Excellent …. eagerly waiting for the next title. Very helpful advice and tips. Well done. Keep them coming…. Most useful, thanks. Can we have tips for common raptors please? Thank you ma’am. We are gradually building a series on identification tips, and raptors will be part of this too! 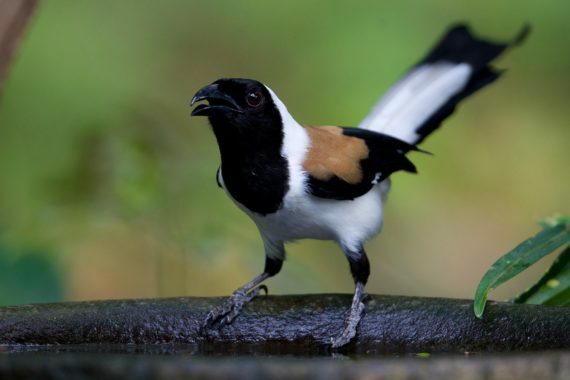 Wow…Bird Count India rocks.More & more technical information now a days.Please provide all this information in PDF.Is it available on BCI page.,?since all corners of your page having information & only information.Great & Thanks for sharing this informative articles. very good piece of Information. waiting for next……. Outstanding article! Thank you so much for it and looking forward to more such great articles! For the other species, simply put their name(s) in the search bar. Hope this helps! Thanks for this article – very helpful!